If you are a close follower of my social media accounts, you will probably already know some of the familiar faces of blogger friends that I have made this year. One of those gorgeous people is the undeniably bubbly (and aptly named) Melissa Bubbles. Together, we collaborated on each of our YouTube channels to bring you two videos filled with laughter and honesty. 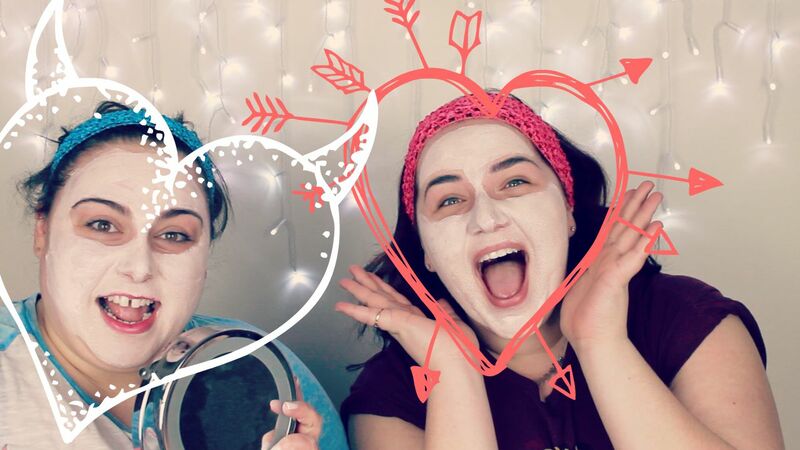 We chose to film the 'Pamper Me Pretty' tag over on my channel, (AnjeliqueTV) and donned some beautiful (read: scary) face masks for the occasion. If you aren't already, I would love it if you would subscribe to my channel (it's free!) and I'll appear in your subscription boxes whenever I upload a new video, so you'll never miss an upload. Make sure you head on over to Melissa's channel and blog as well to see what we got up to in her video! If you want to keep up to date with everything I'm doing when I'm not blogging, make sure you stay in touch with me on Instagram and Twitter, I'm positive I'll be posting there all weekend. Love you lots and I hope you enjoy your weekend wherever you are. Haha thanks so much Sonia, hope you enjoyed! ahahaha how cute is that video! You are amazing girls! You made me smile, have a lovely day! Haha thank you so much lovely! Hope you have a great week! haha we are! Thank you! You two look so adorable! This looks like it was a fun tag! Thanks so much Mini! Hope you have a lovely week!